The Vols will face Colgate Friday in Columbus, Ohio. 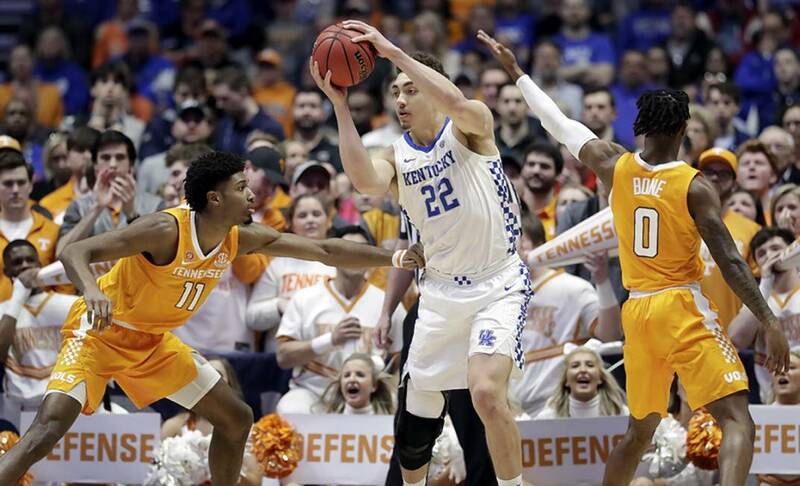 Kentucky forward Reid Travis (22) protects the ball from Tennessee defenders Kyle Alexander, left, and Jordan Bone during their SEC tournament semifinal Saturday in Nashville. Updated at 2:03 a.m. on Monday, March 18, 2019, with more information. NASHVILLE — Sunday was a mostly disappointing day for the Tennessee men's basketball team, as it played poorly and fell short in its bid to win a Southeastern Conference tournament championship for the first time since 1979. The Volunteers earned only their third No. 2 seed all-time for the NCAA tournament Sunday evening and will face Colgate (24-10) in the South Regional in Columbus, Ohio, on Friday. Seventh-seeded Cincinnati (28-6) and 10th-seeded Iowa (22-11) will play in Friday's other game in Columbus at 12:15 p.m. Tennessee will play at the conclusion of that game, and the winners will meet on Sunday. The Vols lost 84-64 to Auburn in the SEC championship game Sunday, their second consecutive loss to the Tigers with an opportunity to claim a conference championship. The Vols fell 84-80 to the Tigers on March 9, costing them a share of the regular-season SEC title, but the NCAA tournament announcement brings new life to the team. "They understand tournament play, it ends very abruptly," Tennessee coach Rick Barnes said after Sunday's loss. "It's tough. I mean, it's tough. As good as they were feeling yesterday, obviously we weren't able to put that behind us enough to know we're going to have to come out and try to re-manufacture it again. I think Grant (Williams) alluded to that, thinking we're going to walk on the floor, just because we played hard yesterday, it was going to happen today." Colgate's 24 wins are the most in school history. Winners of the Patriot League, the Raiders rank 13th in the country in 3-point percentage (.391) and 15th in field-goal percentage (.559). While the Vols were disappointed with Sunday's outcome, they were thoughtful in realizing that the loss wasn't the end, only the close of one chapter. They were a three seed a year ago, and it's the first back-to-back bids for the program since the 2009-10 seasons — which included the Vols' only Elite Eight run in school history in 2010. "We play for the big one. That's how you've got to think about it," Williams said Sunday. "It definitely hurts right now. You definitely have to recollect your emotions, pick your heads up, because you really want this one pretty badly. "The biggest thing is we practice the entire year for the big one. We're coming into the tournament where we put ourselves in a good position this year. Credit to the team. We've just got to do a good job of understanding that it's not over."